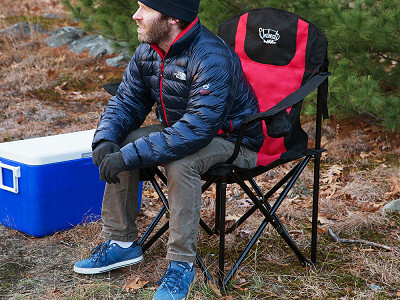 Take the luxury of your heated car seat wherever you go. The Chaheati cover is cordless—charge it from home or the car and enjoy a toasty seat anywhere. Maker Kyle Smith was enjoying a bonfire one chilly night when he realized that his wife kept getting out of her seat to warm her back. When he couldn’t find a portable heat solution, he decided to make his own. Chaheati uses energy-efficient carbon fiber instead of heating coils, so there are no hot spots. The weather-resistant, durable design makes it great for outdoor use. 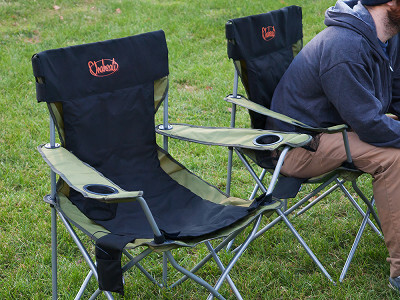 Charge the battery and enjoy hours of heat tailgating, on a fall camping trip, or watching the kids’ soccer game. 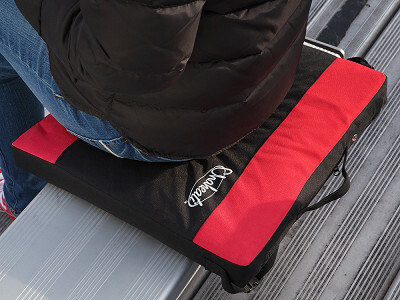 This heated seat pad can also provide relief from sore muscles and back pain. The infrared technology and even heat are often used by therapists for deep muscle penetration. Soothe a sore back and keep warm anywhere. With Chaheati, any seat is a heated seat. Hello everyone! I'm proud to introduce Chaheati to The Grommet. I'd be happy to answer any questions you have! Is it a 1 heat or are their multiple heat options for hotter and colder days? @zach Hi Zach, it has 4 temperature settings. On Max you will get 2 hours, High will be 3 hours, Medium is 4 hours and Low is 6 hours of heat. How long does it stay hot? @Paula Hi Paula, it has 4 temperature settings. On Max you will get 2 hours, High will be 3 hours, Medium is 4 hours and Low is 6 hours of heat. Any discount for purchasing more than one? @Rebecca Hi Rebecca, no there is no current discount for purchasing additional Travel Heated Seat Covers. If you are looking at distribution opportunities, please let me know. Hi Muriel, thanks for the interest. You can contact the Grommet Wholesale Team at [email protected] and they will gladly help you out! If I use it in the car with it plugged in to the car charger, will it stay warm indefinitely? @Clark Hi Clark, no it will not stay charged. The battery connects to the heated add-on to power. It does not have an additional input to charge at this time. How long does it take to recharge once the battery is dead? Also, is there an on/off switch on the battery or does it start warming as soon as it is plugged in to the battery? @Paul Hi Paul, it takes 3 1/2 hours to fully charge. Yes, there is a power switch. Once you plug the battery into the heated add-on, hold down the power key for 2 seconds. The Max blue light will come on, you use the power key(toggle switch) to move through the temperature settings. To turn it off, hold down the power key for 2 seconds and the light will go off. Is this battery operated only? Can it be plugged into an outlet say if used in an office? @Jeff Hi Jeff, it is battery operated only. No, you cannot plug it directly into AC/DC or 12V power. Where is this product produced? @Milly Hi Milly, it is produced in China. Can you purchase additional battery packs and if so how much are they? @Terry Hi Terry, we currently do not have additional batteries; however, you can purchase a car charger. Looks awesome! Can you fold it up in your travel chair without damaging it? @Barbara Hi Barbara, yes, you can fold it up in your travel chair without damaging it. How long will it stay charged before turning it on? Typically I would charge it overnight and use it the next afternoon at my son's baseball came. Will it still be fully charged and ready to use? @Colleen Hi Colleen, it will stay fully charged till you use it. With that being said, if you wait a week or two, you will start losing some of the power. Are the electronic parts removeable so that it can be machine washed? Or what can you say about cleaning spills? @Christine Hi Christine, it is machine washable, just make sure the battery is disconnected. The heating elements within the heated add-on is waterproof and can be submerged. Please make sure the battery does not get wet. @Tom Hi Tom, we use infrared heating technology that helps penetrate your muscles. You should be able to use this in any cold weather within reason of course. Yes, it is waterproof, but the battery is not. Please keep from getting the battery wet. The heated add-on itself can actually be washed. We currently do not have additional batteries but you can purchase a car charger. @ReAnna I am considering this for use at our search and rescue incident command post during a midwinter night. When you say it works in the cold within reason how cold are you talking? Also, I'm confused when you keep saying there is no extra battery but you can get a car charger. Will it run off a car charger? Also, how many layers of clothes will the infrared heat penetrate? @Nancy Hi Nancy, the more layers you have on, the little longer it takes for you to feel the heat. Once the heat starts penetrating, the extra layers act like a blanket. It is harder to feel the direct heat where your skin feels it so hot but you will feel the comfort of not shaking and the warmth. @ReAnna thanks Reanna, and I think you missed seeing my previous question? Hi Nancy, Chaheati can't run off of a car charger, but can, of course, charge fully with it! @Mike Hi Mike, Please correct me if I am wrong, but if the battery dies, it cannot be charged by the AC adapter or a car charger. When the battery dies it is dead, and cannot be re-charged by any means. What happens then? Replace the entire Chaheati? @Janet Hi Janet, the battery is like your cell phone. It needs charged via an AC adapter or a car charger. It is fully rechargeable, I have been using one of mine for 7 years. Mike was saying that the add-on cannot be plugged into a 12V power outlet in your vehicle and run continuous. It cannot be plugged directly into AC/DC power either. The battery powers the heated add-on. Does that make sense? Hi Janet, if the battery dies, it is rechargeable with the car charger. Of course, even rechargeable batteries can die for good. In that case you will need a replacement battery and you can contact our Customer Support team who will help you in getting one here. @Mike Yes, I understand about rechargable batteries. They eventually do die completely, and need to be replaced, just like my cell phone battery needed to be replaced after several years. What I am asking, along with the other folks: Is it replaceable? I see your answer is yes, but we need to contact the Grommet Team. Is this correct? Thanks. That is indeed correct, Janet! I would primarily want a heated car seat in my car. Although it sounds great to be able to have the option to take it out if needed. With the car charger, would this make it an easy to use option for my use? Another words, daily hot seat whenever I am driving leaving the battery in/on? 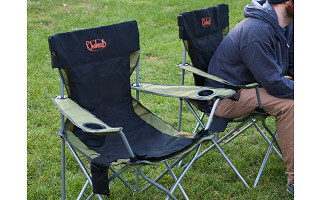 @Barb Hi Barb, yes, Grommet discusses the Travel piece of the heated add-on but we have soccer moms that add them to their bag chairs, tailgaters that add them to their bag chairs or stadium seats, campers use them around a bonfire and sitting outside in the cold, people use them in their office chair or on outdoor furniture. The heated add-on uses a battery to power. The battery is charged by the car charger like a cell phone. You can't plug in the heated add-on to the car charger for continuous power. Does that make sense? How small can you fold it and what does it weigh? @Amy Hi Amy, I can fold it down to 11x7x2 and then again if you need. I have a medium size purse I throw it in. It's only about 2lbs. This product looks great with so many uses. 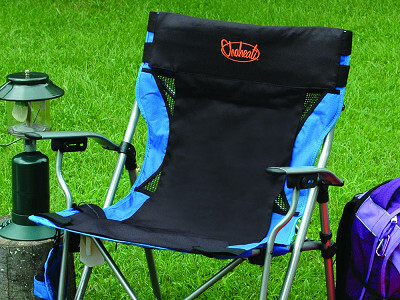 I like that it fastens over the back of a folding chair, so that it will stay in place as you get up and down. However, folding chairs can really vary in width. What are the measurements? for the Chaheati? @Carol Hi Carol, thanks for your interest. Yes, we have thought about your concern. The heated add-on has velcro straps around the top part. It goes from 21 inches out to 24 1/2 inches. I actually undo them if I'm using it inside on the couch or patio furniture. The velcro sticks to the fabric. @Carol You could actually add additional velcro to widen. @ReAnna Thanks so much, that's a great idea. I appreciate the help. OOOOOHHHH..an electric blanket for my bum! Should be perfect out fishing in the boat on a chilly morning! It's going to the top of my Christmas list! This seems like a fantastic item that might well qualify as "durable medical equipment " and so be covered by some insurance policies. I'd personally love to be able to get one for my dad (who ruptured a disc in his back years ago, as well as my great uncle who is in his 90s and could really benefit from something like this. I'll talk to my physical therapist tomorrow and see if there are any comparable pads out there. I'm willing to bet the answer is no. I'll see if I can get you the code for that particular item. I bet there are lots of people who are suffering from back pain who wouldn't have to! And on the go! @Stephanie Hi Stephanie, wow, thank you! Hopefully this will provide comfort for your Dad and Uncle. We would love any feedback regarding the code from your physical therapist. We absolutely would love to get this to the people that it could help! I have read all of these comments about the charger/battery/add-on and I am still confused. Is the add-on the battery? How does the battery connect to the seat cover? What about the guy who suggested that the battery isn't rechargeable and must be replaced? @Milly The battery is a 7.4V rechargeable battery. It is charged via a Car Charger or a AC adapter. It is like your cell phone. I have one I have been using for 7 years. The heated add-on is powered by this battery. You plug the charger into the heated add-on on the right side of the product. There is also a battery pouch on that side to hold the battery. Once you plug the battery in, hold down the power button for 2 seconds. This turns the battery on and the Blue Max Light will turn on. Use the power button(press it lightly) to move through the temperature settings. To turn it off, you hold the power button for 2 seconds and the light will turn off. Where people are getting confused is because some people are asking if they can plug the product directly into a 12V outlet or a power outlet and you can not. It is powered by a battery. Hope this helps. Let me know. Sorry for the confusion! @ReAnna To clarify, you plug the battery into the heated add-on. 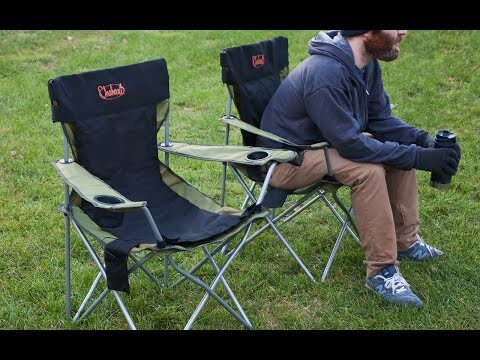 How would this work in a stadium seat? @Joe Hi Joe, I'm going to try to put a picture on here. If not, I'll have Mike send one to you. @Joe Joe, I just sent a pic to Mike. He will forward it to you. It just slips nicely over a stadium seat you see at NHL and MLB stadiums. It is like a slip cover and the width can be changed from 21 to 24 inches. My brother in law is a quadriplegic. He feels the cold terribly. Would this be safe for use by him in his wheelchair? He does how issues with regulating his own body temperature but I thought the lowest setting may suit his needs. I have also worked in the field of disability for over 30years, and can see a huge market for clients with similar needs. On the product page, it gives the dimensions as 9x3x11. Sure looks larger than that! More like 20-24" in length. Are the true dimensions given there? Hi A. Marina, thanks for the qyestion! We have the dimensions for Chaheati rolled up. Flat, it measures to 14" x 36". Of course, that size will change as you fold it to fit a seat, but that gives you an idea of what you will be working with. Size: folded lxwxd; open, axbxc. @Mike This is a great product as a heated car seat, for those like my belle-mère, who used to have heated seats, but which the current car lacks. Present fodder! Present fodder for those who want to be hotter! Thanks for the comment, A. Marina! How much is the car charger? Do you have any photos of it fitting a bucket seat? Hi Joanie, the car charger is $14.95 and can be found here!